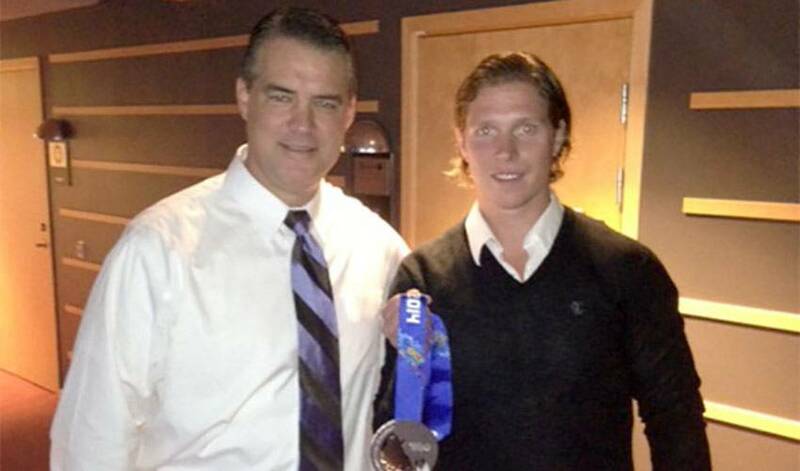 Nicklas Backstrom finally received his silver medal from the 2014 Sochi Olympics on Thursday, more than six months following the conclusion of the Games. The highly-skilled forward, who played a crucial role in helping Sweden reach the gold medal hockey match, was honoured in Gavle and received his medal as part of a ceremony prior to a Swedish Elite League game between his former club team Brynas and Djurgarden. On February 23rd in Sochi, Russia, only a few hours before the start of the gold medal match, Backstrom, a center for Team Sweden, was told he would not be permitted to play in one of the biggest games of his hockey career, due to a positive test for a banned substance. The substance was later confirmed as Zyrtec-D, an allergy medication that he has been taking for years to treat a condition known as sinusitis. Backstrom was forced to miss the gold medal game and could only watch as his teammates faced off against Team Canada in a game that saw the Canadians come out on top 3-0, securing back-to-back Olympic gold medals for the North American nation. On March 14th, the International Olympic Committee ruled that Backstrom had both requested and received specific advice from the Swedish Chief Medical Officer that the allergy medication he was taking would not give rise to an adverse analytical finding. They further ruled that he had followed specific medical advice from his team doctor. As a result, the IOC ruled that Backstrom would receive his silver medal. That day came on Thursday when Backstrom was finally given the opportunity to receive his well-earned Sochi silver medal in front of friends, family and fans in a ceremony with Swedish ice-hockey officials. Joe Reekie, NHLPA Divisional Representative and former NHL player, was also in attendance on behalf of the Players’ Association. Congratulations Nicklas, from the staff and members of the NHLPA! Based on Nicklas Backstrom's number one pet peeve, we get the impression he is a pretty laid back guy! More on the alternate captain for the Washington Capitals in this week's Player Q&A.